A Sacred Symbol is a lay-out of the stones used during a treatment. When the stones are taken off the client, they’re placed ceremoniously on the floor in a pattern by the therapist. Creating Sacred Symbols is an ancient Native American practice used in Inyan Pejuta – Stone Medicine. Originally there would be Stone Walkers who gave the treatment with the stones and placed the stones in Sacred Symbols afterwards, and then others who could read and interpret the layouts. Now a days there are no more symbol readers left and the art has mostly disappeared. The practitioners of Inyan Pejuta picked up a bit here and there and do offer readings of the stones. Sacred Symbols are used in LaStone and Stone Medicine. They make for a nice supplement to a bodywork treatment and often the clients are asked to look at the symbol and receive the messages there are in it for them. It can be a piece of art and beauty to find joy in, or it can be deeper messages that can help one during difficult times. 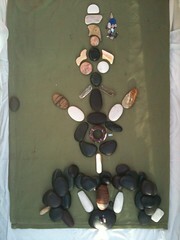 The picture is one of my own Sacred Symbols, made on the third day of our recent LaStone® Sacred Strokes course. Jenny Ray, our teacher did a reading on the layout which I’ll share with you. At the bottom she saw a strong foundation. Lots of stones piled on top of each other, solid. Where two stones on top of each other indicates a desire to connect with Creator, several stones on top of each other indicates that I’m already connected to creator. In the circle in the middle she saw the sweat-lodge, a sacred ceremony for the People. The small crystal there is actually a small buffalo, and Jenny saw the buffalo carry my prayers out through the east to Creator. The east is where the eagle reside who carries our prayers up to Creator. Above is a clear pathway without obstacles or any great choices. A balanced path leading me onward in my life. As the practitioner becomes more and more familiar with her stones and the communication between them becomes stronger, the Sacred Symbols become easier to read and the messages clearer. Sacred Symbols can be an interesting thing to study and explore.